Ukraine has recently adopted a National Environmental Strategy for 2020 and a National Action Plan to protect the environment on-going from 2011 to 2015. One of the goals of these initiatives is to bring Ukrainian environmental policy closer to EU standards. The EU pledged €35 million through a Sector Budget Support Programme (SBS) to support the National Strategy and to help the Ministry of Ecology and Natural Resources of Ukraine better protect Ukraine’s environment. We met with Anna Golubovska-Onisimova, one of the key experts of an EU project* which supports the Ministry of Ecology in implementation of the SBS, to discuss the current state of affairs of Ukraine’s environmental reforms. How would you describe the role of the National Environmental Strategy and National Action Plan in bringing Ukraine closer to the EU’s environmental policy standards? These documents present the first ever European-like environmental policy in Ukraine. They have a clear goal, limited number of objectives, and prioritised directions of activities according to each objective. Moreover, they also have a defined timeframe, a mechanism for monitoring and reporting, and performance indicators. All these characteristics create a basis for regular reporting and assessment of the effectiveness of proposed measures, especially on how well environmental policy instruments are working. Will proper implementation of these documents help the Ukrainian environment move closer to EU standards? The first stage, as foreseen by the National Environmental Action Plan, will last until 2015. It focuses on stabilising the environmental situation. Environmental problems are very complicated in Ukraine and have accumulated over many years, starting in the Soviet past. The situation requires more significant resources and much more time to see real improvement. The EU pledged €35 million of Sector Budgetary Support to help implement the National Environmental Strategy. What are the key priorities of this support? The overall objective of this programme is to help Ukraine implement the new environmental policy outlined in the National Environmental Strategy. There are specific priorities: to support the integration of environmental policy into sectoral and territorial development policies; to approximate Ukrainian environmental legislation to EU norms; to build the institutional capacity of the Ministry for Ecology and Natural Resources to implement the new policy, including: simplification of environmental permitting system, [AM1] modernisation of environmental monitoring systems, better access to environmental information and public participation in environmental matters. There are also four sub-sectoral priorities: stabilising the air pollution from power plants, improving the quality of surface water, increasing the retreated and recycled percentage of municipal waste, and increasing nature protected areas (up to 5.9 per cent of the territory in 2011). Would you say that one of the EU’s priorities in supporting Ukrainian environmental reform is to integrate environmental priorities into other national policies? It is not simply a priority: environmental policy integration is obligatory in the EU and it is fixed in its legislation. In Ukraine, integrating environmental policy changes into all relevant legislation is foreseen through the Strategy and National Action Plan. It hasn’t been done so far, however. Do you think that the environmental issues are paid enough attention in EU-Ukraine dialogue? In the EU-Ukraine Association Agenda and its priorities, we find the following section: “the parties will consider establishing a high-level dialogue on environment protection issues.” I think that this is a very important opportunity to move the environment from a technical issue to a more political level. Indeed, we really need better environmental governance in order to improve the situation. In this regard, government can do more in terms of better defining its agenda and prioritizing the environmental issue. Based on the [European Neighbourhood Policy’s] new “more for more” principle [more EU financial support for more reforms], the government could also facilitate a new stage of cooperation with the EU. You have recently participated in the environmental chapter of the Eastern Partnership European Integration Index-2012. According to the Index, Ukraine has the worst environmental situation among EaP states, but its environmental policy is relatively good (Ukraine came second in this aspect). How would you explain this paradox? On the one hand, we have a very rich natural environment and unique ecosystems of different climate types and about 70,000 species of flora and fauna (about 35% of the biodiversity in Europe). On the other hand, we have a lot of accumulated environmental problems. They create the need for very effective environmental management to clean up the territory, and stringent environmental standards to decouple economic growth from environmental degradation. That’s why cooperation with the EU is important for Ukraine in its environmental reform. The EU provides an example of the most effective environmental policy, including achievements in greening the economy. In December 2012, the Working Group of Ukrainian NGOs presented the public assessment report on the national environmental policy implementation in 2011. How would you describe its key conclusions? Our project supported public consultations for this report as well as its publication. The opinions expressed in the document belong, of course, to its authors – over 200 Ukrainian environmental NGOs that took part in consultations held in five regions of Ukraine. One of the key issues stressed by this assessment is Ukraine’s limited institutional capacity to implement modern environmental policy. As far as environmental integration and compliance with environmental requirements are concerned, not only the Ministry of Ecology and Natural Resources is responsible. NGOs say that environment is the weakest point in the system of centralised power of Ukraine. Indeed the whole government should be responsible for integrating environmental priorities into national policies. The NGOs recommended that the first step for doing this be changing legislation. These changes would make environment integration obligatory and prioritize cross-cutting instruments and procedures, such as the environmental impact and strategic environmental assessments and public participation and access to information on environmental matters. The report also recommends increasing the role of the Ministry of Ecology and Natural Resources in decisions on economic policy and large project development in order to facilitate long-term environmental impacts. This and other recommendations of the public assessment report will hopefully be discussed further by the Ministry and NGO Working Group in order to make it operational. 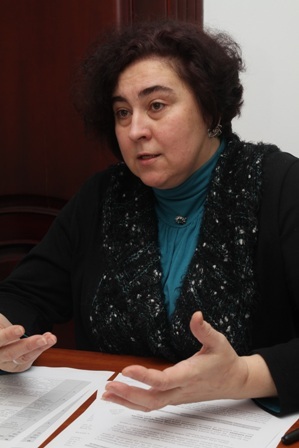 * Anna Golubovska-Onisimova is the Capacity building, coordination and visibility expert of an EU-funded project “Complementary Support to the Ministry of Ecology and Natural Resources of Ukraine for the Sector Budget Support Implementation”. Based on policy dialogue and capacity-building, Sector Policy Support programmes integrate EU assistance into the reform strategies of partner countries, such as Ukraine. With support from the EU, Ukraine has set its own development goals and is accountable for its achievements in a sector. EU payments to the government budget are made when the agreed goals are met.